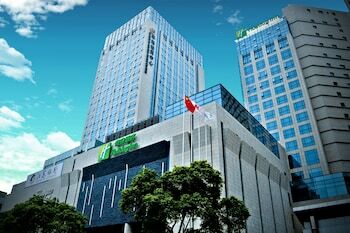 Located in Shanghai (Songjiang), Holiday Inn Shanghai Songjiang is within a 15-minute walk of Square Pagoda Park and Zuibaichi Park. Featured amenities include complimentary wired Internet access, a business center, and dry cleaning/laundry services. Planning an event in Shanghai? This hotel has 1087 square feet (101 square meters) of space consisting of a conference center and meeting rooms. A roundtrip airport shuttle is provided for a surcharge (available 24 hours), and free self parking is available onsite. With a stay at Guangyuan Hotel in Chengdu (Jinniu), you'll be within a 15-minute drive of Yong Ling and Southwest Jiaotong University. A shuttle from the airport to the hotel is provided at no charge. With a stay at Changzhou Elan Hote in Changzhou (Tianning), you'll be 3.9 mi (6.2 km) from Tianning Temple and 13.8 mi (22.2 km) from Wujin Museum. Free self parking is available onsite.